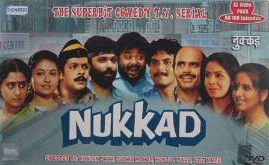 Episode #4 of Hindi TV Serial Nukkad is talking about film stars, their popularity and their influence on the audience. You may not find this episode very funny or message conveying. Though, it must be said that, this episode succeeds in conveying the message that we don’t have to put our real stuffs on the stake for something we love or hate on the silver screen. One needs to have the wisdom to distinguish between the reality and fantasy. The situations shown in the episode are quite realistic. And we often see verbal spat or even fight occurs between the lovers of two competitive actors, sport persons or similar. The things are taken from real life and filmed in realistic way. Chaurasiya, the Paanwala, is a big fan of Hindi film actor Amitabh Bachchan. He decided to hang a photo of Amitabh in his cabin wall. All the fellows at the Nukkad have asked him to not to do that! The reason is, Khopdi, one of the fellows at Nukkad (who always found drunk) is a big fan of Rajesh Khanna and is not fond of Amitabh! Chaurasia decided not to surrender his wish to just avoid a conflict with Khopdi. The incidents happen then after are the rest of the episode. You may not find the episode very appealing as mentioned earlier. You may also found it offensive of Khopdi to not to allow anyone doing anything against his wish. Though, Khopdi is not a bad man from the heart. The way everyone supported Khopdi is not to support his wrong attitude, but just to keep him happy (as he is always in the sorrows and thus found drunk); but again, one element of the society cannot hold everything else at stake for his own wrong wishes. It is not good for the society. Sameer is one of the main character of this episode and he plays his part really convincingly. Actually if you have had seen him for the first time in this serial, you can never imagine him as a common man who is not drinking. Such a convincing his gestures are. Pawan, Dilip, Rama, Haider, Sangeeta,… all them are convincing. They look characters rather than looking themselves. And, that is the biggest achievement for any actor. The background music of this episode is equally good. The dialogs are pretty nicely written. They have punch within. The script should have been better. The locations are realistic and the wardrobe is authentic. Overall, the episode fails to create the charisma, the previous episode was able to. But, it is definitely something you can watch. Do not forget to share this article with your friends over various social networks via Twitter, Facebook, Google Plus and others. And yes, you may like to subscribe to our RSS feeds and follow us on various Social networks to get latest updates for the site to land right in your mail box.